In 1855 Wilkie Collins presented Charles Dickens with his first original drama – The Lighthouse. 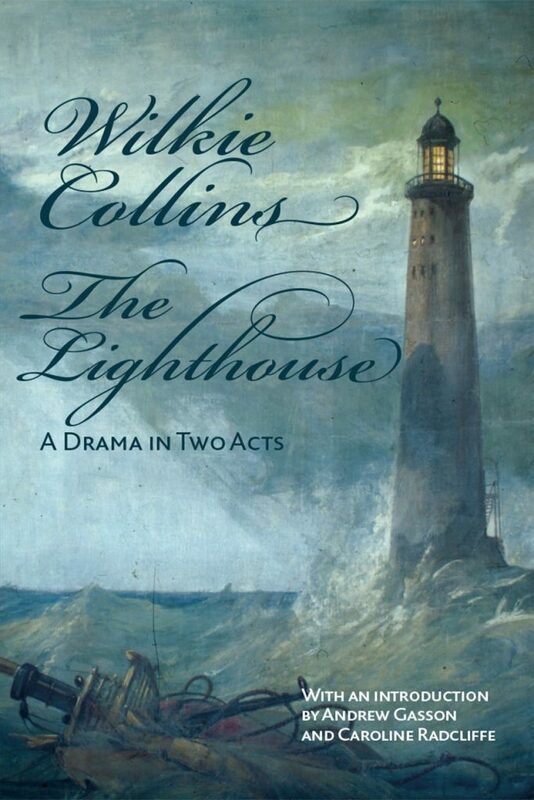 Set in the Eddystone Lighthouse in 1748, Collins creates a tense, psychological drama employing elements of crime and the supernatural familiar to readers of Collins’s fiction. Initially staged at Tavistock House, the role of the guilt-ridden old lighthouse keeper, Aaron Gurnock, provided Dickens with a vehicle for his extraordinary acting technique, accompanied by members of his family and friends from his literary and artistic circle. This is the first printed, English edition of The Lighthouse. The volume transcribes the version licensed for the Olympic Theatre in 1857 which includes the ‘Prologue’ and the ‘Song of the Wreck’ contributed by Dickens. It also contains a Foreword by noted crime writer P. D. James, an introduction providing a detailed account of the play’s history, contemporary reviews and numerous, newly-discovered illustrations. Caroline Radcliffe lectures in the department of Drama and Theatre Arts at the University of Birmingham, publishing on popular Victorian theatre and sensation drama. She is also an active performer and has directed Wilkie Collins’s play The Red Vial. Dickensians will be happy to have a published version of this notable forerunner of The Frozen Deep. Collins’s The Lighthouse is a two-act melodrama in the performance of which audiences were electrified by what Carlyle called Dickens’s ‘wild picturesqueness’ in the role of the guilt-haunted lighthouse keeper, Aaron Gurnock, in three private performances at Tavistock House and a public one for charity at Campden House. The text for this edition is based upon a careful collation of the four surviving manuscripts, including Collins’s own which is in the Victoria and Albert Museum. The Prologue and an introduced song ‘The Song of the Wreck’ , were both from Dickens’s pen. The editors provide a most interesting and informative account of the writing of the drama which they see as anticipating the ‘psychological drama’ as manifested in Lewis’s The Bells by sixteen years. They trace its stage history both in London and Paris where it was produced as Le Phare in 1864 with a specially written preface by Wilkie Collins, a translation of which is included in this volume. The editors supply also a wealth of other relevant material, including several illustrations (one a head-and-shoulders portrait of Dickens looking remarkably sinister which I have never seen before) and a number of newspaper reviews of the Campden House performance as well as subsequent professional productions both in London and New York. Reviews of the Campden House production were unanimous in the very high praise they bestowed on Dickens’s performance.’The part is melodramatic’, said the Daily News critic, ‘but Dickens’s melodrama is void of extravagance: it is a display of passion carried to the utmost intensity, but without overstepping for a moment the modesty of nature’. The Times gave the production a lengthy review and described Dickens’s Aaron, ‘a rough, rugged son of Cornwall’, as ‘a great individual creation of a kind that has not been exhibited before’. The Editors are to be congratulated on the remarkable thoroughness of their account of the performance history of Collins’s play. I noticed one small omission in that there is no mention of an amateur production staged by members of the Dickens Fellowship in April 1950, using an edited edition version of Collins’s manuscript, Dickens’s prologue being spoken by Frank Pettingell, a leading British actor of the day. Dickens’s part was impressively played by John Greaves, later Honorary General Secretary of the Fellowship and celebrated for his wonderful Dickens readings, and the part of Lady Grace, at whose presumed murder Aaron wrongly believeds himself to have connived, was played by Dickens’s grand-daughter Elaine Waley. The play, according to The Dickensian, ‘proved to be most moving in performance’. It would be good if this fine edition were to inspire another modern production.